You know the old saying that when you don’t know what else to talk about, talk about the weather? Well, it’s not that there’s anything else to talk about or that I don’t want to talk about anything else, it’s just that I woke up this morning after listening to the wind howl most of the night and it’s freezing cold outside! What makes it harder is that yesterday it was nearly 50 in Grand Island; ice was melting everywhere, if you were out without a coat you might not care. So this feels even colder. 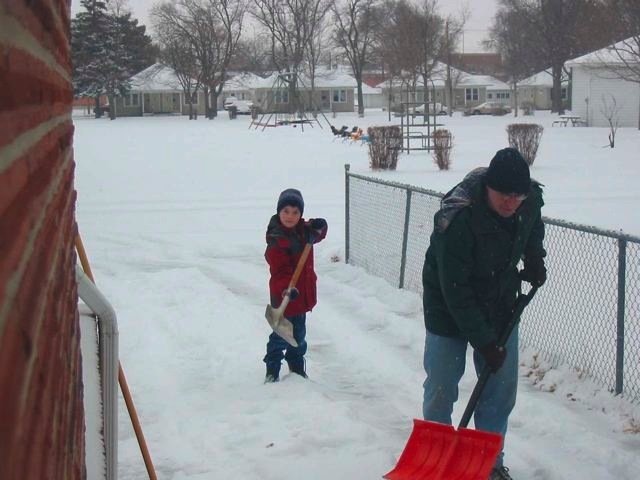 This picture with this post comes from January 2004 (I love the look of Andrew as he helps shovel snow. ), but that’s the feeling you have today. The snow isn’t deep enough to shovel, but it’s blowing really hard and drifting. I filled the car with gas this morning and it was a miserable experience standing there with the wind cutting my face the whole time. I grew up in Minnesota and so I mock people here in Nebraska when the complain about weather. But this is uncomfortable. So, it’s a good day to get things done inside and thank God for providing shelter.